Sandberg, L. Anders, “On Stockades and Bridges: From York University to the Jane and Finch Neighbourhood.” In (Sandberg, A., S. Bocking, C. Coates, and K. Cruikshank) (eds.) Urban Explorations: Environmental Histories of the Toronto Region. Hamilton, ON: L.R. Wilson Institute for Canadian History, 2013, pp. 96-118. Sandberg, L. Anders, “Promoting Environmental Education at the University: The Campus as a Sticky Wicket,” Our Schools, Our Selves, Vol. 19, No. 1 (Fall 2009), 25-32. Sandberg, L. Anders and J. Foster, “Stormy Weather: On Hurricanes, Water, and Hard Choices at York University,” Critical Times, Vol. 3, No. 5 (April 2006), 6-7. Sandberg, L. Anders and J. Foster, “Playing Tennis at York University: Game, Set and Match Tennis Canada,” Critical Times, Vol. 3, No. 1 (January 2004), 6. 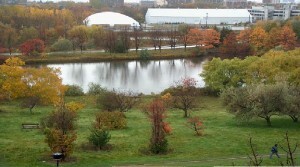 Stong Pond on the York University Campus before it was expanded. The Pond in its old form was deemed deficient since it was considered too small to hold the runoff for the campus. However, this position ignores the deficiencies of the Pond’s “headwaters,” the paving over of the campus and the resultant massive amount of water that flows into the Pond.